Morrisons Fall Fishing Trips Deliver! Although at Morrisons, we don’t think you need one more reason to get out and enjoy the pristine waters of the Rogue River, late September marks the beginning of a rare and thrilling opportunity. Most steelhead are born in the river and trek downstream to the ocean where they remain for several years before heading back to their spawning grounds. Half-pounders are another story. Found in only three rivers on the entire continent (Klamath, Eel, and Rogue) this rare micro-breed make the journey to the ocean and make a quick U-turn for a tough swim upstream after only a few short months. What they lack in size, they make up for in vigor. These fish know how to fight. Because they have not reached sexual maturity when they return, this micro-breed doesn’t spawn and die. Rather, they hang around feeding happily in the Rogue River all winter. Because they travel in large groups, and our experienced guides know just where to find them, a fall trip is sure to impress the most seasoned fisherperson. 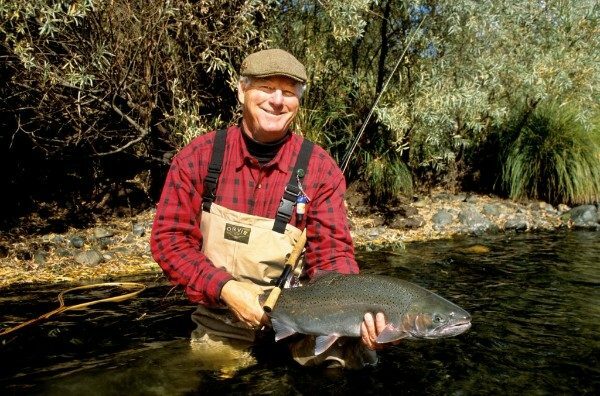 In fact, we recently caught the attention of Terry Shelley from Salmon & Steelhead Journal who chronicled his epic steelhead trip in this month’s issue. Come experience the thrill of steelhead fishing for yourself. Morrison’s has been guiding world-class fishing trips on the Rogue River since 1946—in fact, it’s the reason the lodge opened in the first place! Our professional guides are experts in a variety of steelhead fishing techniques such as single and double hand fly fishing, spin casting, bait bouncing, the Rogue River twitch, and pulling plugs. Whether you’re a beginner or an experienced fly fisher, we’ve got the trip for you. Thinking of planning your own steelhead adventure? Check out a recent article featuring Morrisons in the Aug./Sept.issue of Salmon & Steelhead Journal.